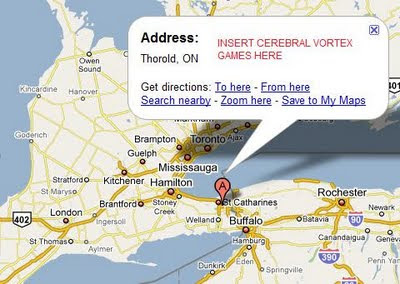 Cerebral Vortex Games, a developer of casual video games formerly based in St. Catharines, Ontario, have announced that they are consolidating operations at a brand new office located in Thorold, Ontario. "Our new Thorold office is already in full operation," said Keith Makse, President of Cerebral Vortex Games. "We're developing great casual games for PC, iPhone and other platforms." Games that are currently in development at the Thorold office include the musical memory game Sonus, and the augmented reality game Ghost Breaker. Both titles will be available soon for the iPhone. I had a chance to learn a bit about Ghost Breaker at the August IGDA Toronto event and it sounded really cool. It utilizes the iPhone camera and turns your real-life environment into a spectral battleground where you shake, tap and swing the screen to repel and capture the ghosts. The region's economic development organization, Venture Niagara, will be providing support and funding to Cerebral Vortex Games' new Thorold office. "We are pleased to provide financing to Cerebral Vortex Games. This company has great potential in an industry that is creating jobs and growing the local economy. We wish Mr. Makse and Cerebral Vortex much success," stated Frank Rupcic, Venture Niagara's General Manager.